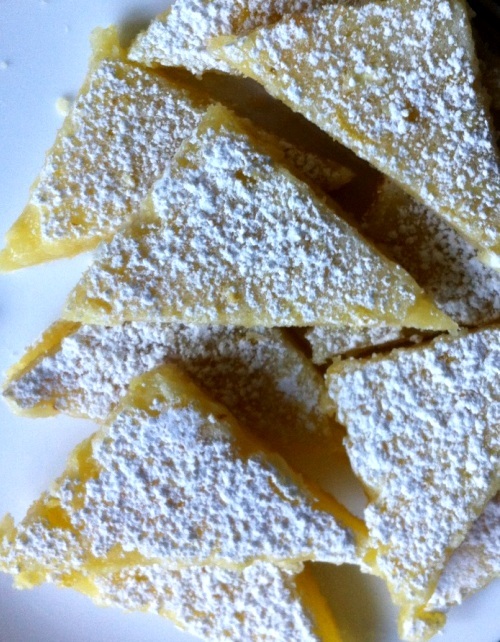 Lemon Bars are an iconic combination of tart and sweet in one bar cookie. A shortbread crust, soft filling, and tart lemon make for a luscious combination. The bars are also attractive. Yellow filling contrasts stands out against dusted white powdered sugar, making the bars an especially light treat in the spring or summer or as a contrast on a tray of assorted cookies. Line a 13 x 9 baking pan with parchment paper: turn the pan upside down, smooth the parchment paper around its contours to fit, flip the pan over, and set the formed liner inside the pan. Allow the liner to extend a couple of inches over both ends of the pan as an overhang to use as handles for when you remove bars. Using an electric mixer on low speed, combine crust ingredients in a large bowl until mixture is crumbly. Press crust mixture evenly into parchment-lined pan. Bake for 20 minutes until crust is set and just begins to turn light brown. Meanwhile, in a medium bowl, beat together filling ingredients until well blended. Pour filling mixture onto hot crust. Spread evenly. Return the pan to the oven. Bake for 15-20 minutes until filling is set and bars are lightly brown around the edges. Remove pan from the oven. Set it on a wire rack to cool completely. Use parchment paper overhang to lift cookies out of pan and place on a cutting board. Press paper edges flat. With a sifter or shaker, dust bars with powdered sugar. Use a sharp knife, cut bars into large squares, and then diagonally to create triangular-shaped cookies. With a spatula, lift bars off paper-lined cutting board and into an airtight container. Place waxed paper in between layers for storage. One key to successful Lemon Bars is a firm crust. Check to make sure the first layer is set before spreading the lemon filling on top to bake. Fresh lemon juice, while preferred, can be substituted with bottled lemon juice. If you like extra-flavorful Lemon Bars, increase the amount of lemon juice and grated lemon peel by a quarter or half, to taste. Add 1-5 minutes extra baking time to make sure the lemon filling sets. The extra tartness is a surprise but keeps the bars from becoming too sweet.